Are computers about to become conscious? Please have a look at my eBay sale, which will continue through the summer. I keep using the same picture because, if you can't see the nameplate on the back, these cameras all look alike. Recall that my Father's Day present was an exhortation from Melody and Sharon to update my astrocameras. The blue DFK cameras are 8 years old, and less money buys more performance nowadays. 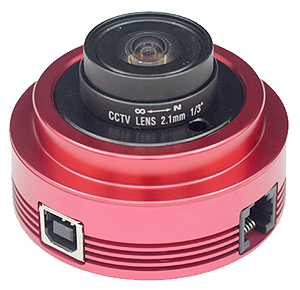 What's more, these ZWO cameras are Chinese, and tariffs are coming; Internet sales taxes are also coming. I bought an ASI120MC (original model) used, then an ASI120MC-S (newer, higher-performance, Linux-compatible model of the same camera) new shortly afterward, and now an ASI120MM-S (monochrome, good for autoguiding) has joined it. I've sold one of the blue cameras and will be selling the other, as well as the ASI120MC. But there may be no astrophotography for weeks to come. Tonight was predicted to be clear; instead, we've had heavy rain all day long. In physics and engineering, if you are going to use a function such as logarithm, sine, cosine, etc., on a dimensioned quantity, you must first fix the dimensions. That is, you can meaningfully write a formula that uses the logarithm of length in meters, or the logarithm of temperature in Kelvin, but not the logarithm of length or the logarithm of temperature. Clearly, the logarithm of 2 kilometers is not the same as the logarithm of 2000 meters, nor does it differ by a factor of 1000. So you can't say it is in kilometers or meters. Fixing the dimensions in the formula effectively makes the number dimensionless so you can do mathematics on it. A distance in meters is a pure number, and arithmetic works on it; a distance, by itself, requires dimensions. There is a long, rambling page in the sci.physics FAQ that almost explains this. It does lots of calculus. You don't need to do calculus; all you need to know is that the logarithm, sine, cosine, etc., are not composed of simple addition, subtraction, multiplication, and division. How is it that the volume of a cone is 1/3 that of the cylinder that encloses it? That puzzled Melody for a whole afternoon when she was in high school. I am delighted to have married the kind of girl who would sit around and think about such a thing! Here's the answer, but I'll approach it indirectly. First let's do the volume of a square-based pyramid. Imagine a 1×1×1 cube. Find its center. Let the center be the apex of a pyramid whose base is one of the faces of the cube. Clearly, you can do this for all six faces, and when you do, you've used up the whole cube. Accordingly, such a pyramid is 1/6 of the volume of the cube. It is also only half as high as the cube, since it extends only from a face to the center, not to the other side. Now stretch the cube so that it doubles in one dimension. Clearly, the pyramid still occupies 1/6 of the cube. But the cube is now 1×1×2, and the pyramid is 1×1×1 (the third dimension being height), and the volume of the cube is 2, and the volume of the pyramid is 1/3. Got it. The volume of a 1×1×1 pyramid is 1/3, and you can get the volumes of other pyramids by stretching this one as needed. But what about cones? Stick with me for a moment. We're going to use Cavalieri's Principle, which says that the volume of a stack of coins remains the same if you shift some of the coins sideways (even if they are square coins, and even if they are not all the same size). A pyramid, for example, is a stack of square coins each one smaller than the one below it. That is how you show that the volume doesn't change if the apex is not centered above the base. You can also re-shape the coins to make them rectangular or even circular, provided you leave their area and thickness the same. The volume of each coin remains unchanged, and so does the volume of the stack. That's how you get to non-square pyramids, and even cones, which are simply non-square pyramids that are circular. If you think about infinitely thin coins, you might be expecting me to tell you that the key to it all is that the integral of x2 is x3/3. I hereby mention that in passing. Although not very speckled, the sun is no longer blank; the new sunspot cycle is beginning, and it turns out that my ASI120MC-S camera is good at photographing sunspots. 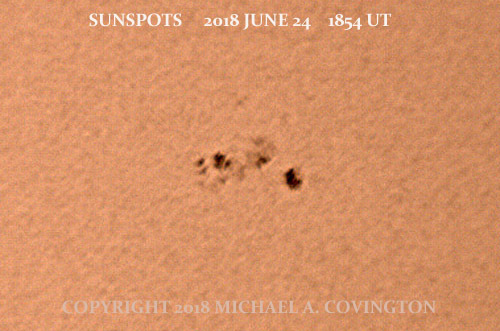 Here you see a sunspot group and the granulated surface of the sun, photographed with my Celestron 5 (f/10), a Thousand Oaks filter, and the ASI120MC-S. The hard part was using the laptop outdoors in the sun. Even with an improvised canopy over it (using a sunlight reflector intended to go inside a car windshield), I had a hard time seeing the display. 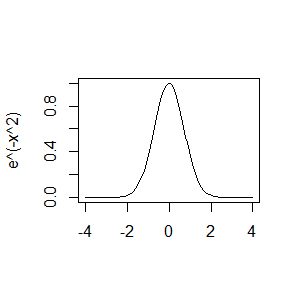 The equation of a Gaussian bell curve is just e-x2 plus scaling factors. The more complicated formula that you have seen (and can't remember) just scales the curve in both dimensions. That means its logarithm is an upside-down parabola, -x2. 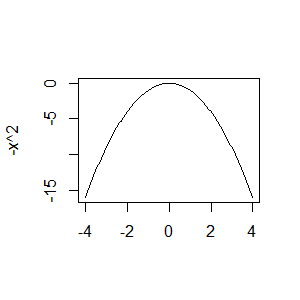 That is useful, because to fit a parabola to a function, all you need to know is where the peak is, plus the location of one point off the peak. This is used often in Bayesian statistics. 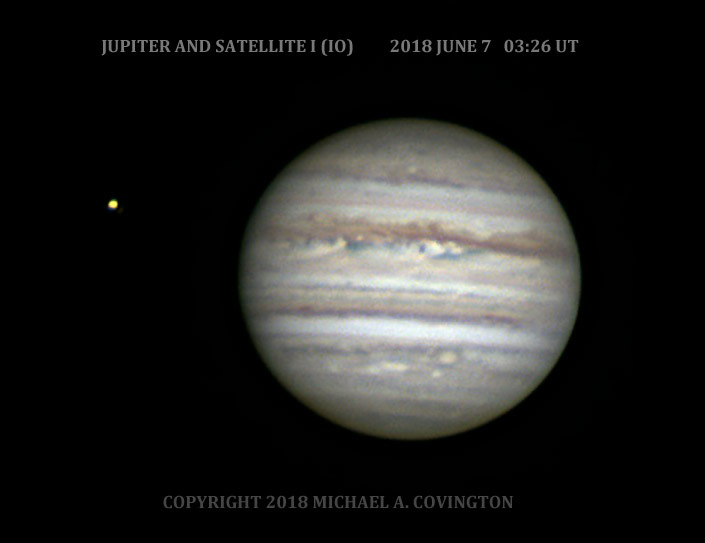 A nice pair of pictures of Jupiter and Saturn through the same telescope at the same magnification, showing that Saturn is nearly twice as far away. (The Solar System is big!) 8-inch telescope, dates and times as shown. This news item raises interesting questions of academic ethics. If you could order anyone to do anything, what would be the best way forward? How near could you come to undoing the harm and making the victim whole? A talented clarinet student was offered a full scholarship at a very prestigious music school to work with a famous teacher. His girlfriend at the time forged e-mail and kept him from finding out about it. He later studied with the teacher briefly through a different school and found out what had happened. He sued her, and she lost; the judgment was Canadian $300,000. That is certainly a better outcome than could easily have happened. The ex-girlfriend's goose is thoroughly cooked. Either she pays in full (which might be possible if she has liability insurance), or for the rest of her life she will not be able to buy a house or even get a credit card. I rather hope a significant percentage of her income can be attached and paid to her victim. The victim behaved intelligently to mitigate the damage; he thought he had been rejected in good faith, so he pursued other good opportunities and got a good education (at higher cost) and a good job. In the opinion of a music professor I consulted, he might well have gotten a higher-paying and more prestigious job if he had gone to the better school. (We're not sure; there are many unpredictable factors.) He is certainly out the cost of going to a different school without a full scholarship. Those are presumably things the court determined and calculated. Crucially, if the school gave him the scholarship now (which they might be willing to do! ), he wouldn't quit his job to go back to school. Time has passed. His career has begun to develop. Assuming that he wanted the better education only in order to get a higher salary. No; people don't go into classical music for the salary; they do it because they want to play their instrument as well as possible, give something to the world, and earn recognition. Assuming he's the only victim. There are at least two others. The school lost a student they really wanted to recruit. They weren't able to use their talents in the way they thought best. The teacher spent his time teaching someone else who was presumably very good, but not the student he was especially looking forward to. And the whole world's supply of good musical performances was presumably impoverished. What if one of the best clarinetists were even a tiny bit better? The world would be richer for it. One thing I think would help would be for the music school to pipe up loudly that they are also a victim. If this gentleman can't be one of their alumni, maybe he can at least be known as the student who was stolen from them, someone they definitely considered to be of their caliber. Two technical points. First: An honorary degree, if the music school wanted to give him one, wouldn't really help. He still hasn't actually been there and received their instruction. Second: If he had been a research scientist, there would have been a better way to compensate him. Give him a 3-year postdoctoral research fellowship, with salary, to work with the scientist whom he had wanted as his teacher. This could be done at any stage of his career, even if he had been out on a job for ten years, and would give him the opportunities to do valuable, prestigious work that he had missed earlier, and achieve at least 3 years of career advancement while doing so. But music careers don't work that way. 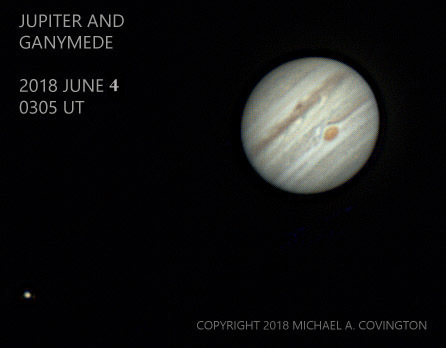 My goal, in mastering any astrophotographic technique and setup, is reproducibility. The goal is for the question no longer to be, "Will I get anything?" And I think I have achieved that with Jupiter this season. Using the new camera, I took a whopping 6200 video frames in just two minutes, then stacked the best 50% of them. This picture shows that the Great Red Spot has not changed significantly since a few days ago. I saw an unconfirmed report that a streak (a "festoon" as Jupiter observers call it) had developed across it. If so, it's gone now. And this is as close as I have come to observing in the rain. I left the CGEM mount set up last night, with the telescope removed of course, with a heavy plastic bag over it, just in case. The day was hot and dry, but at 6 p.m. we had a downpour. By the time I got out to observe Jupiter, just before 11 p.m., the sky had cleared, but the ground was still fairly wet. Towels and dew heaters were used liberally. I'm glad I got this Chinese camera before Trump's 25% tariff kicks in. I may order more Chinese equipment very soon. By the way, I don't see how this camera could be classed as stolen technology. The heart of it is a sensor from ON Semiconductor, formerly part of Motorola, and still an American company. The sensor may have been made in Asia, but not surreptitiously. The church that I belong to is part of the Southern Baptist Convention, a loose federation of churches that is (despite its name) nationwide. It has just had its annual meeting, and there was what I can only call an impressive outpouring of good sense. First, just before the actual meeting, the Convention expelled a church for racial discrimination. I leave it to you to look up the news reports. We've come a long way. Another sign of rising moral standards has to do with improper sexual behavior. We've had a series of scandals involving one of our long-revered leaders, Dr. Paige Patterson, who was president of a seminary. I cannot testify to the accuracy of the charges against him, but there were three levels: (1) some bad advice and improper remarks to and about women; (2) apparent cover-ups of rapes committed by someone else; and (3) a problem with insubordination, scheming to remove trustees who objected to what he was doing. Item (3) only came out at the convention and overshadowed (2), which had overshadowed (1). He's out of there. Another seminary president expressed both dismay and thankfulness that a large number of other allegations of sexual harassment or other impropriety are gradually coming out and being investigated. He said that we always thought that since we're not tightly organized, we couldn't have the kind of conspiracy of silence that a hierarchical church could have, but in fact the silence is just as damaging when not organized. I might add that it might even be easier to cover things up when it's not clear to whom you're accountable. All that is getting cleaned up now. The second big change was putting distance between ourselves and the Trump administration and campaign. Too many people, both in churches and outside them, seem to have assumed that good Christians are supposed to be good Trumpers. That didn't sit well with me, and now the convention has gotten its head clear. The convention passed a resolution on immigration that calls for families to be kept together, contrary to Trump's policy. In so doing, it joined Catholics, Methodists, and virtually all other organized Christians, who had made similar statements. More surprisingly, when Vice President Pence spoke, he was given a lukewarm reception, and the newly elected convention president almost immediately Tweeted that the speech had sent a mixed signal. Mr. Pence is a real Christian and was expected to talk about his faith, which he did. But in the middle, he gave a long campaign speech in praise of the Trump platform and administration. Even people who agreed with the politics felt that it was out of place. A third good sign of a rising intellectual level was the presence of Ravi Zacharias as a keynote speaker. His specialty is the intellectual defense of the faith. One thing was disconcerting. Another keynote speaker was financial guru Dave Ramsey. While I agree with his basic claims — people should avoid debt, and his method of getting out of debt is often successful — he teaches two false doctrines, one that his plan is "God's way of handling money" (not just a godly way of handling money), and the other, that the Bible says never to borrow. For Father's Day, Melody gave me (or told me to buy) a ZWO ASI120MC-S astrocamera. That's just like the ASI120MC that I recently acquired, except that it has a better brain (a better on-board computer). It communicates through USB 3 rather than 2 and is fully supported by Linux. And sure enough, it gives me considerably higher frame rates, when the exposure time permits. Sure enough, it worked very smoothly the very first time I took a picture. This is the best 75% of about 3400 video frames taken through an 8-inch telescope. It could probably be processed better; I may come back to it. Are computers about to achieve humanlike consciousness? The current enthusiasm for commercial artificial intelligence (which, as data analysis and automated decision-making, is very useful — hire me to build some for you!) has started people speculating about Kurzweil's singularity and the notion that in a few years, computers will be more intelligent than people and will take over the world. Will that really happen? In my opinion, no, not any more than electric motors will take over the world. Computers are very useful for processing information (and motors are very useful for making things move), but they are not very much like human minds (or bodies). The really crucial point here is that there is no known technical path toward making computers conscious. It is not like someone in 1920 thinking about how to land a man on the moon. That person could confidently say that if specific problems were solved — propulsion, guidance, air to breathe — then a trip to the moon would be possible. Some of those smaller problems were still unsolved in 1920, but people could see their way forward. They were already experimenting with high-altitude aircraft and laying the groundwork. Consciousness is not like that. We know plenty of ways to use computers as tools to help us process information. These tools often surprise us with their effectiveness. It's easy to forget that information processing is not the same thing as reflective consciousness. If you're a banker, you can estimate a person's creditworthiness from his bank statements. So can a computer. But you are doing it by reflecting about your experience, while the computer is going by statistics. The computer is probably more accurate most of the time, but the human being is more able to cope with the unexpected. A person in 1100 A.D. might think that to compute 123 + 456 = 579 requires human consciousness. Today we have machines that do it. The same analogy applies to many other information processing tasks. We keep realizing, step by step, that the ability to perform humanlike intellectual tasks is not the same as consciousness or general intelligence. I want to underscore that there is no clearly foreseeable technical advance that would "make computers think." Neural nets are not going to unlock it, nor quantum computing, as far as anybody knows. We are not like space-flight enthusiasts of 1948 eagerly looking at captured German rockets and seeing ready-made solutions. Right now, people tend to think that any machine that recognizes speech is close to human in its thinking. Far from it! I've already written about the harm that can be done to children by giving them an artificially intelligent talking-listening doll as a companion. It trains them to act like a computer, not a human. Regarding the hype about "the coming singularity" on the part of professionals, I have a few observations. (1) The usual way to end up convinced that consciousness is merely computation is to start out with that assumption. It is an assumption I do not make, although I acknowledge that the rest of the picture is a deep mystery. (2) Avid computer programmers often make an ontological mistake: They simply ignore aspects of reality that they cannot see how to represent computationally. This can include a distaste for engineering (technically close to computer science) because it involves non-ideal properties such as the inductance of a capacitor. Never mind other aspects of human life! (3) For people who believe in it, "the coming singularity" is all to often a matter of faith — or supersition — or Gnosticism — or something. It is something metaphysical that they pin their hopes and fears on, and they believe in it for reasons that go beyond cool rationality. Count me out. But if you need to do useful things with data, including human languages, count me in! My new camera is serving me well, especially since I cleaned it with a Sensor Swab and substituted a shorter USB 2 cable. (ASI pushes USB 2.0 to its limits, and slightly past them.) Each of these images is with my 8-inch telescope, as usual, and created by stacking thousands of video frames. 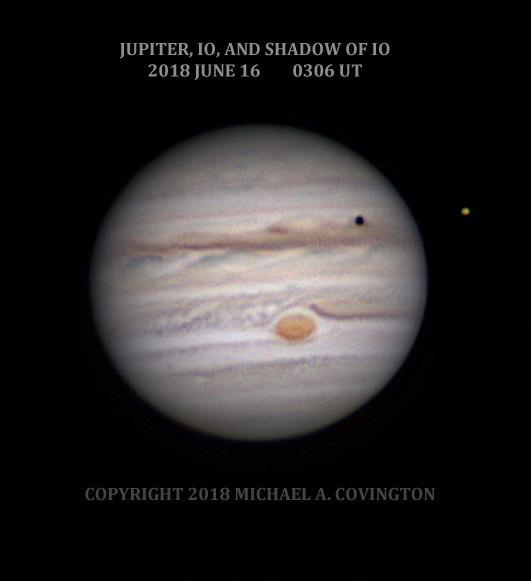 In the Jupiter picture you can see the Great Red Spot, which is appreciably smaller than when I first started observing it decades ago, and has developed a spot in the middle. You can also see the yellow-orange color of the satellite Io, whose surface is covered with sulfur. As you know if you've ever seen sulfur melt, in its various allotropes sulfur is yellow, red, and black. Io has a mix of all three. In close-up space-probe pictures, it looks a bit like a pizza, although I'm sure it smells far worse, if you could smell it. 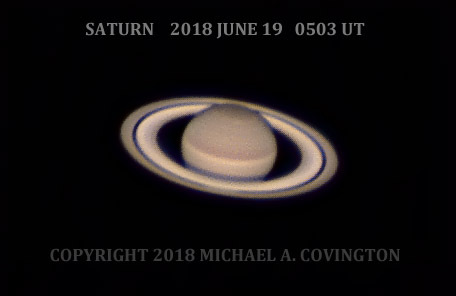 I stayed up late for Saturn, which is now rising late at night. The Saturn image is magnified more than the Jupiter image, which is why it is less sharp. The bluish color in Cassini's Division and on Ring C (the dark ring) crossing in front of the planet is genuine, although in real life grayer than in the picture. I had to consult a Hubble picture to confirm this; back in the days of visual observing, we all knew that Cassini's Division was black. This is a stack of seven 5-second exposures at the f/10 Cassegrain focus of the telescope, calibrated with dark frames. It's not a very good picture because (1) that's not enough exposure time, and (2) that's probably too much magnification for that object with this field of view. But it was a test. The workflow, so far, is rather strange. I take the images with FireCapture 2.6 for Linux and save them as FITS files. The first one in the series always comes out blank (solid black) and is discarded. Further, the FITS files are marked as black-and-white images while they are actually un-deBayered color images; as a result DeepSkyStacker won't deBayer them. PixInsight will calibrate and deBayer them just fine but won't align and stack them (can't find the stars). 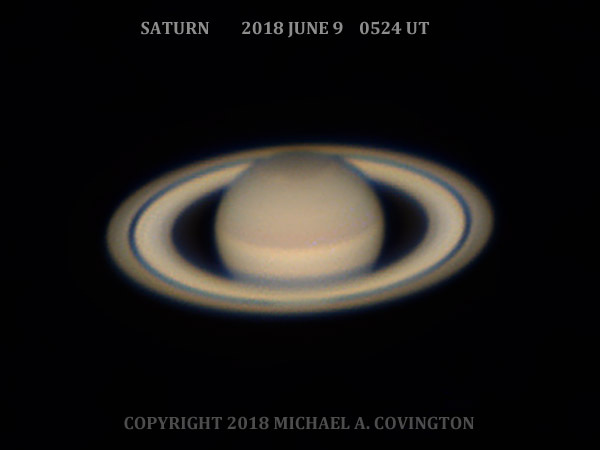 Some parameter tweak to PixInsight will surely fix this, but for now, I'm doing the stacking with DeepSkyStacker after doing everything else with PixInsight. I probably have news for two or three software developers now! [Update:] With appropriate settings, DeepSkyStacker will do this with 16-bit FITS files but not 8-bit FITS files. In the future I'll capture 16-bit images, and that's that. There goes the neighborhood: Two good friends, one of whom is an eminent computational linguist, have bought the house next door. A remarkable amount of the computational linguistics in the South will be concentrated into two adjacent houses! For the first time in my life I'll have a next-door neighbor who shares my technical interest (just what 8-year-old boys aspire to; I'm a little older than that, but still, it sounds like fun, and we couldn't wish for better neighbors). The previous occupant of the same house was one of my teachers in my undergraduate days and was present when Melody and I met. 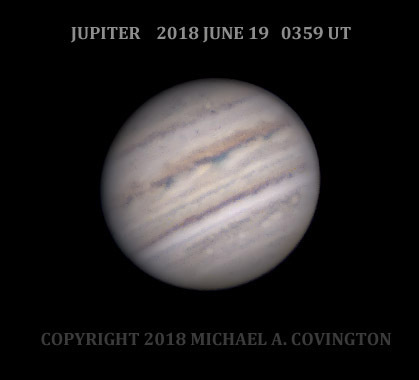 A pain in the gut: The astute reader will note that I didn't photograph Jupiter on the 7th (8th UT). I've had a bout with diverticulitis, an intestinal infection that is not serious, but very pesky, and when severe, needs to be checked out to rule out complications and other diagnoses. Thus I found myself being X-rayed Thursday evening. I'm OK; it's just going to take a while to recover completely. Mild symptoms can linger for months. Actually, I had my annual physical just 2 days earlier (Tuesday) and very slight symptoms were present, but the doctor and I thought they were left over from an earlier episode. Surprise — it was a new one starting. Our 2013 Maytag Bravos X washing machine has already been declared beyond economic repair, with multiple electronic failures. (Definitely not a simple mechanical failure; a technician checked it thoroughly.) It has a microprocessor, of course, and can run diagnostics, and the results are quite grim. Even if they are incorrect (which is quite possible), the only way to fix them would be to replace the motherboard, at high cost. So we got a new LG washing machine this time; like its predecessor, it is a high-efficiency (HE) model. HE means "more time, less water." The wash times are even longer with the LG (up to two and a half hours for a load), but there is also a speed wash mode that takes only 32 minutes (and uses more water), just like at the laundromat. That is going to be handy, although of course we prefer the other modes when they are available. This washing machine has Wi-Fi. I haven't put it on the network yet. If and when I do, it will be behind a firewall; I don't want curiosity-seekers hacking into it! By the way, our 2013 Maytag Bravos dryer is also disappointing; a humidity sensor acts erratically (and the instruction manual leads us to believe this is expected), so it can't always judge whether clothes are dry. Word has reached me of the death of my graduate-school classmate and friend Charley Hoequist, whose specialty, at least early in his career, was phonetics, especially the rhythm of speech. My understanding is that he moved into the computer field later, but I didn't keep in touch very well. Another of his interests was the Russian language and Russian affairs. He was a member of the renowned Yale Russian Chorus. The online obituary is here. The funeral will be at Spanish Fort Presbyterian Church in suburban Mobile, followed by burial in his home town, Orlando. This is with the same 8-inch telescope, 2× extender, and ASI120MC camera. The difference? The air was unusually steady. Stack of the best 75% of 2916 video frames, processed with AutoStakkert and PixInsight. This was not intended to be a good picture, just an experiment with putting some equipment through its paces. 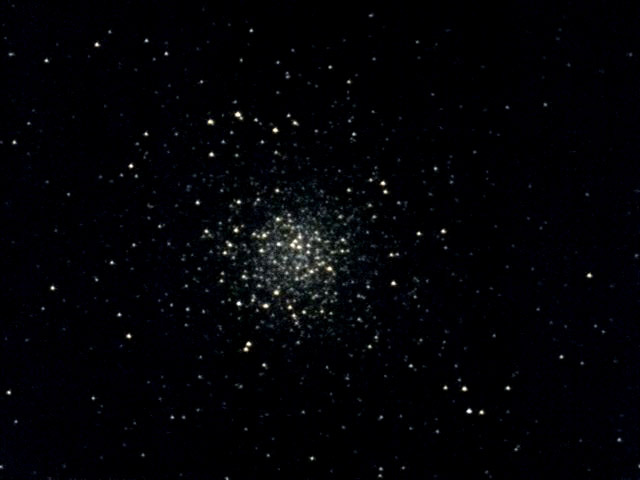 I captured eight 5-second exposures of the globular cluster M4 and eight matching dark frames using the same camera and telescope (without the extender, so it operated at f/10 instead of f/20). Processing didn't go too smoothly. DeepSkyStacker gladly calibrated and stacked the images, but it didn't recognize the images as color filter array (RGB, Bayer) images, so the result came out monochrome. That was almost certainly a setting in the capture software (FireCapture). I'll revisit the question soon. 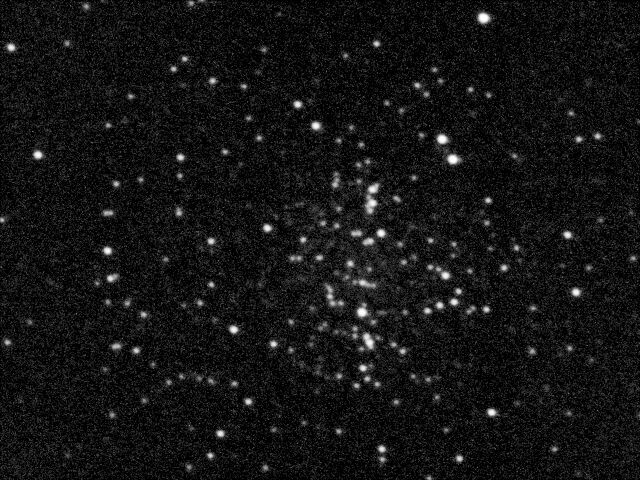 Although not a high-performing deep-sky camera, the ASI120MC is great for practice — it works the same way as larger dedicated astrocameras, one of which is almost certainly in my future. 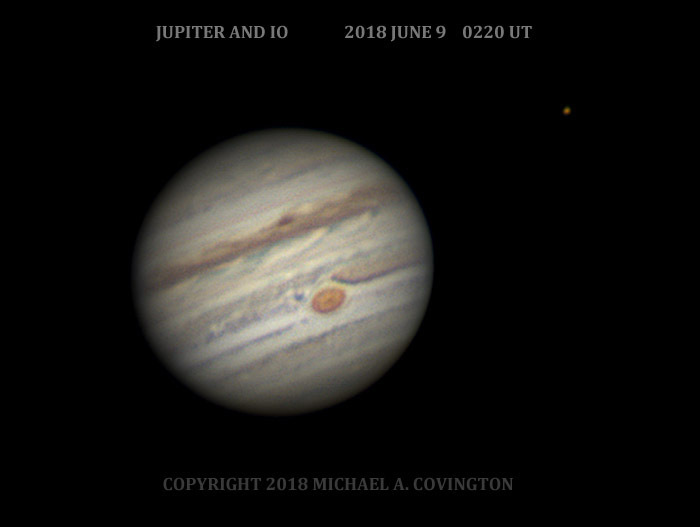 Here's Jupiter with the 8-inch telescope and ASI120MC camera. This is representative of the results I hope to get fairly consistently. Best 75% of about 2200 video frames, Celestron 8 EdgeHD with 2× extender. I ascertained that the camera has a couple of dead pixels. I can make a dead-pixel map so the software will eliminate them, but in order to use it, I have to record the full frame. Two alternatives are to choose a recording area that doesn't include them, or simply let the planet drift around (due to imperfect guiding) and rely on the software to reject the dead-pixel values as deviant. [UPDATE:] Apparently it doesn't have dead pixels after all. To get rid of some dust that had gotten on the sensor, I used a Sensor Swab on it, and not only did the dust go away, so did the dead pixels, which must have been tiny dust specks. Either that, or my indoor tests cannot reveal them. I highly recommend Sensor Swabs. Note corrected date on pictures. 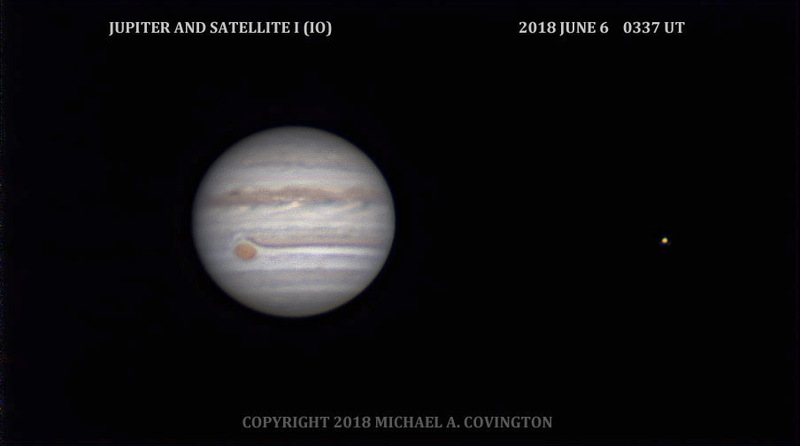 These were June 3 EDT, June 4 UTC. Athens has had, if I counted right, 19 consecutive days with rain, but that is ending. 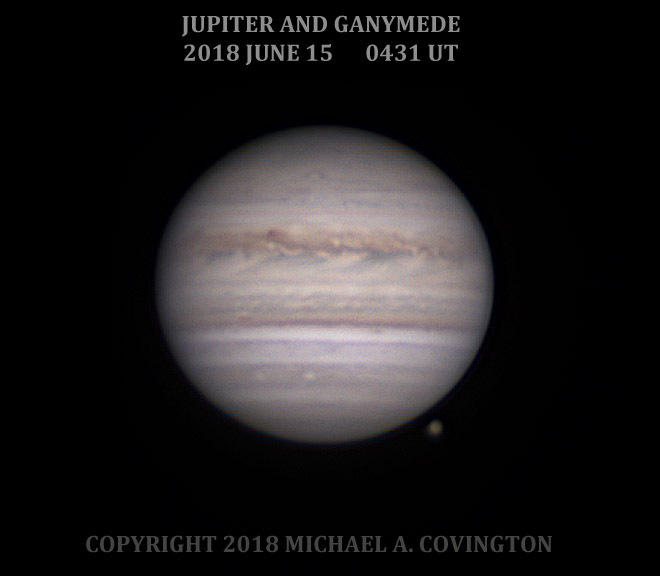 The sky cleared this evening and, expecting unsteady air, I got out the smallest usable telescope, my 1980 Celestron 5, to try out the ASI120MC camera on Jupiter. As you can see, I was successful. 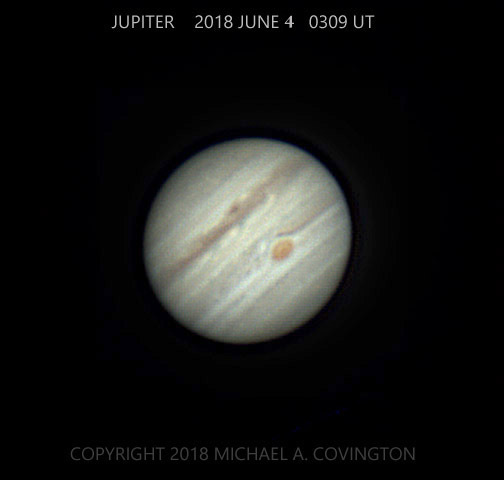 I used "ROI" (region-of-interest) mode to record just part of the field of view, and FireCapture even automatically tracked the planet to keep it in a small field of view despite imperfect tracking by the telescope's drive motor. Very handy! These are stacks of the best 75% of, respectively, about 3300 and about 2000 video images with a 2× extender ahead of the camera. You've been hearing about GDPR (General Data Protection Regulation). That is a European Community law that basically prohibits the indiscriminate collection and sharing of mailing lists and other personal information. At least, that's how I understand it. That is, it bans one of the most annoying practices of businesses on the Internet. Under GDPR, anybody that wants to keep any data about you generally has to get your permission and use it for the purposes to which you consent. They can't share it or even keep it when there is no longer a business need. This web page is served in the United States and so not affected by GDPR. But there's an even better reason it's not affected by GDPR: I do not collect any personal information on this web page. Never have, never will. For the same reason, you do not need a secure (HTTPS) connection to this web page. There's nothing to keep secret.